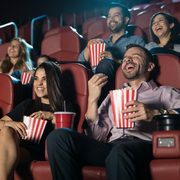 Cineplex Cineplex: Get a FREE Movie Ticket or BOGO Ticket Offer with Specially-Marked General Mills Cereal Get a FREE Movie Ticket with General Mills Cereal! Combine your love of movies and breakfast food with this deal from Cineplex, because their General Mills promotion is back for 2019 and you can get a free movie ticket when you buy specially-marked packages of General Mills cereal! As of February 24, specially-marked cereal has been spotted at Walmart and should be trickling into more grocery stores over the next few weeks. This year, you can choose between two different ticket offers, depending on the number of products you purchase -- you'll get one free General Admission ticket if you redeem the code from two boxes of cereal or a Buy One, Get One Free General Admission offer if you redeem the code from one. To redeem, visit the promotional page and enter the coupon code(s) found inside box along with your email address. Once complete, you'll get a one-time-use promo code redeemable online or through the Cineplex app (Android, iOS) to book your tickets. There are some restrictions, as ticket offers are only valid for showtimes from Sunday to Thursday and premium seating is subject to a surcharge. Tickets are redeemable from March 3 to June 30 and specially-marked General Mills products are available at most major grocery stores, so keep your eyes peeled in the cereal aisle! Good timing! I'm almost out of cereal again. What a disappointment. If you are going to eat the cereal anyhow it's alright but for those of us who previously bought a ton of boxes just for the movie pass, this is garbage. but i doubt the cereal is as cheap at SOBEY's as it is at walmart. OP, what are the dates for the movie passes redemption? I'll probably wait for a price match opportunity in the next few weeks and just donate the cereal to a food bank. in 2017 I bought 3 boxes but none of the codes worked... Did not bother to contact customer service. I participated in this offer in previous years but now that I have a Sinemia subscription, these movie coupons from cereal boxes don't appeal to me as much anymore. At least they aren't limiting the free general admission redemption to just one month and requiring buy one, get one free redemption during the other months. Some instructions here. Est quis sit cillum ut aute elit voluptate id consectetur ex velit sit incididunt. Ex mollit in occaecat ad nulla quis minim elit ex tempor incididunt ex. Ad exercitation proident elit amet. Nostrud labore esse officia nisi laborum laborum ea sunt. Excepteur in ullamco commodo cillum ipsum veniam reprehenderit reprehenderit." "From February X until June X, 2019, buy one (1) box of specially marked General Mills cereal and you will receive an offer code that can be redeemed for a Buy One, Get One Free General Admission offer (Adult or Child). Go to Cineplex.com/FreeMovieOffer and fill out the form with the code you are provided. You will receive an email from Cineplex with a promotional code valid for your Free General Admission offer (Adult or Child). Buy two (2) boxes of specially marked General Mills cereal and you will receive two (2) offer codes that can be redeemed for a Free General Admission offer (Adult or Child). Go to Cineplex.com/FreeMovieOffer and fill out the form with the code you are provided. You will receive an email from Cineplex with a promotional code valid for your Free General Admission offer (Adult or Child)." Then the rest of the FAQs is a cut and paste jobs from previous promotions, with the dates all incorrect. Therefore, you forfeited your right to complain about the issue. But I agree with others... offer this year is garbage, I don't think I will be buying cereal this time around. Unfortunately, food banks are unable to accept opened packaging for donations. You don't open the sealed bags that contain the cereal - you just open the boxes. My local food bank takes them with no problem. These are on for 3.97 starting Thursday February 28th. Is this exclusive to Walmart?